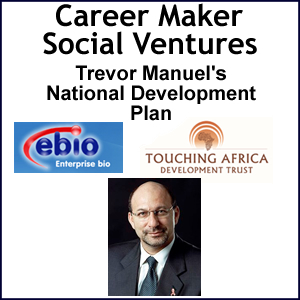 Trevor Manuel in his speech on the National Development Plan said that they will be taking a capabilities approach to economic capacity development. 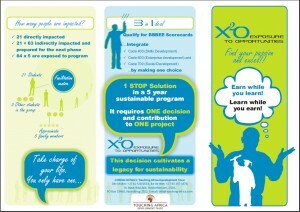 X2O and with Career Maker, Ebio and Pro. Japie Kroon from North West University delivers this capabilities approach in economic capacity development. Careerdevelopmentplan.net offers a solution to economic capacity delivery with exposure to opportunities. We write this as X²O, it is a geometric growth model, thus to the power 2. We learn, work, invest and benefit together. Everybody gains, the top end keeps on growing faster and the bottom ends catches up because of the transfer process, which is in line with the speech made by Minister Trevor Manual as part of the national development plan. You can find the whole speech on the web on info.gov; this is what we work from. The plan predicts that by 2030 we will live in a community that we have remade, and we would be proud to be part of this community. This will be a community where everyone will grow economically, personally, as a family, as a community, as a tribe and as a nation. Mr. Trevor said the leitmotif has been that we want to eliminate poverty and reduce inequality. Consistent with the diagnostics they found the highest priority is education, which is exactly what we aim for. We have found over the last 15 years that there’s a tremendous opportunity in bridging the gaps. As people cross the gaps, cross the bridge, everybody gains, they most of all, but all of us still gain and grow, and the country grows as well. Everybody knows that the haves have all the health, wealth, happiness, choices etc. They also have an abundance of knowledge and experience. The not-haves are in short supply, they need education. Through education health will come, poverty will reduce and safety will increase. They have a scarcity of knowledge, experience and resources. If you look at the opposite triangles the knowledge is on top, with few people. Little knowledge exist with the many, it’s simply a transfer process for everybody to gain. When you look at the flows: knowledge down, people up, then the whole pyramid grows upwards, we all get healthier, wealthier and happier. A fantastic vision should we achieve it. Let’s look at economic capacity delivery, Minister Manual also state that three complementary enablers are required. The first is an active citizen, the second is a capable and effective state, where the state must become more effective but the citizenry must also use the state more effectively. The third enabler is strong and mature leadership. Our program works with local leaders, supporting the elected and appointed leaders to grow faster. If we can get an active citizenry in harmony with government, academic institutions, business etc. it will set a new paradigm in development. People say: “I want a job, I want the right job, I want to grow in my job.” The people at the top wants to grow faster in their jobs, the people in the middle just want the right job and the people at the bottom, the broad mass of South Africa, simply want any job. If we can address those three requests, which we believe we can, we believe that getting a job and earning more can be a very exciting experience. We believe this after many years in business and many years in pro bono work with universities and communities. People using the Career Maker System often got 30% and more salary increases within 18 months. The secure, safe and certain way towards your ideal salary in the job you’ve chosen, the company you’ve chosen, the industry you’ve chosen and it lets you grow your career in a way that is best for you, aligned with your inner, natural talents. We like to say that people that are aligned like this never work a day in their lives. I’ve been privileged to be there for over 20 years, it’s a fun place to be. Let’s look at the insight, opportunity and knowledge spread, what is the current situation? We like to look at it in six levels. People that currently sit with vast talents but they don’t have the knowledge, insights and access to resources to use those talents. Then people who are under- and unemployed in this area and then people who are safely employed but wants to grow, people that are great but wants to grow, people that are fantastic and want to grow. If you look at the six natural levels of work competency, you can see that knowledge is up here and little knowledge is down here. That is what we believe drives the stratification, this ever increasing gap between rich and poor, which is no good for anybody and the more people that can become economically active the more big business, the government, everybody will grow. Let’s briefly look at our three companion products; it is the Career Maker System, which makes an impact and a difference in increasing your productivity and your salary within a fairly short time with a high impact. This product is also offered within companies, within work teams, and we hope shortly within government institutions. Exposure to opportunity X²O that include work and study readiness and is meant for people that take a little longer and have a few more gaps to bridge. The people are fantastic, they just earn base competencies. With their families and community they can increase the support and increase their ability in the core five proficiencies: language, numeracy and so forth, to grow to where they can enter the big system of the economy and contribute as they want to. We use the learning methodology from ebio developed with Education and work place learning in mind. We have developed a sustainability model where the program becomes scalable with web support and local agents as companions. The web supplier is Tribe Centric. 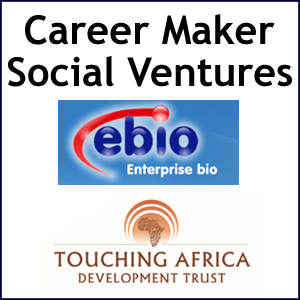 Let’s briefly take a look at Career Maker. It’s on the web, web-supported and originally developed from our multi-million dollar businesses we developed as well as one of the largest incubators ever in South Africa. If you look at the process you can see the whole process of career change, just scroll through it, it’s all there on the web, and how people grow their salaries. X2O and its brochure are on the web and we’ll take a look at that just now. 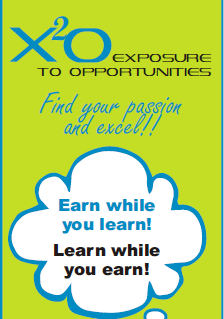 X2O, also on careerdevelopmentplan.net, you will see all the areas of work proficiencies that get addressed. You can download the brochure from the website. You can also look at some companion products and services that go with it. There’s something at the bottom of the page about the core five proficiencies. You can read more about that on the web. Lastly, if you look at ebio, it has similar processes, with individual growth in six steps and it’s also available on the web, you can read it when you have the time. Lastly, we found that with scalability it is very important that the community mobilise the people behind the leaders, for the leaders, by the leaders. Therefore, we have created the More South Africa space, where people can join up for activities like project management, forums, groups, and newsletters. There’s a store where the products and services plus the companion products and services are offered in and by the community, supported by a highly competent set of managers and management teams. Thus we believe we deliver exactly what Minister Manual recommended. We can thus play a role in the vision of the future of South Africa. Productivity must be in sync with formal education, and to integrate the three products, if you look at the six levels, the mass at the bottom, the few people at the top, and ebio creating an army of learners, working with and through institutions, primary, secondary, tertiary education, as well as education within companies, supporting the gaps in core proficiencies, and growing from there. Secondary, Secoza NPC offers the services where the learning curve is a bit longer because of the gaps being a little bit bigger and there being more gaps. Working with a solid measurement process that gives you solid feedback on the web, it’s like a dashboard of people’s development, community development, how many are engaged and so forth. Career Maker offer the same services at the top, where there’s a higher impact, the core proficiencies already exist, it’s a slightly higher level offer to people employed on the higher end. Just to integrate the three then, the focus is in the middle, but such that each one grow by itself bringing people up, growing people up. Each area grows by itself and thus the overlap grows. That’s a concept they often call a balance. Look at every person, whether employed at the high end or at the very bottom end,, we deliver a model that is suitable to them to make their purpose clear. The purpose drives objectives and actions, and synchronizes with adapting your vision and mission very dynamically. We all know that a person with a clear vision, a clear purpose, is almost unstoppable. We found that to get recognition; we have to get people with clear visions and missions that are clearly aligned with their objectives and tasks. Secondly what people have to understand very early on is that there is a game with rules, they must know the rules and play by them. So many people spend their energy fighting the rules, instead of spending their energy where they can make decisions, make a difference using and building on the rules. This creates people that are easy to govern, people that fit and drive and maintain the rules. They also understand that there’s unlimited space where they still have influence, but they can still explore and make it known, while growing their space of production. It’s very simple models and we have a whole lot of exercises underneath to make sure this is implemented. We are now going to look at how to break out of the box. This is like a glass plate, it is all perceived, none of it real, but where people are at the moment it is awesomely real to them, it is the absolute truth, you can’t argue that perception is reality. To change those perceptions they have to go through three simple steps, they must know what they currently do and are, and what they want to become and want to do. Then they have to prepare and communicate this clarity. In our full sets you will get all these activities in full. They grow what they currently do and what they want to do. They then clarify this to communicate it so they can break the glass plate, go beyond it, break out of the box and get to the great spaces. Again, these are simple actions, we just give some examples. Thirdly, still, breaking out of the box, getting the glass plate to disappear and get to the great space, they need to then engage and communicate with the people where they want to go, people that have the knowledge that they want. Go be useful to them, work with them in an apprentice, intern style. They will work for knowledge at this time, not so much to get paid. At some early stages pay tends to be survival, but we also coach people in the same technique that recently moved from well over a $100 000 in earnings to 1.3, 1.4 million dollars in earnings. So the process works right at the top, works right at the bottom, at the bottom it’s just slower, community, home, and resources must be integrated. Again, just some selected steps. People get recruited, go through a process, get the hard skills of their industry, and align the whole process with the National Qualification Framework Level 1 to 5, and through phases that we take them over a period of time. The bigger the gap the longer the time but the process is the same. It’s a clear process, I just want to show you briefly what is behind it. The process is designed to break the boxes and break the glass plate and move to the great spaces. This big migration is exactly what Minister Manual talks about. In your infrastructure there’s outbound values and inbound values, demand leading to supply, so everybody benefits, everybody gains, everybody earns as they learn and even learn to earn. The infrastructure partners are always local or the big telecom providers with broadband and communication. Supporting the foolproof Career Maker System we have a business toolset and a personal toolset which I will just briefly click. The business toolset is available on careerdevelopmentplan.net as I’ve shown earlier and there is a whole set for social ventures, business ventures and most of the rest personal because personal growth grows social ventures and grow business ventures. The personal and the business toolset are available there. In conclusion, let’s look at how we hope to spread. We attempted to explain these five years ago in an actual graphic set. What we hope to do is to grow from home to home, the process is designed to be passed on for free, in the family and from home to home, and supported at the formal qualification levels. We have proven that it can go from home to home, through communities, from community to community, we hope Africa wide and we hope from Africa to the world, proudly African and only from Africa.